Most businesses across Australia expect their employees to undergo a National Police Check. However, different states have different rules and legislation regarding how to obtain the National Police Check Certificates. If you’re based in Queensland and need to obtain a police check – whether for a job or an insurance application, then you probably have a few questions about this process. Note that you have to be a resident in Queensland to be able to apply for the national Police Certificate through Queensland Police. The two most common types of Criminal History Check offered by the Queensland Police are a National Criminal History Check and a Queensland Criminal History Check. Queensland Criminal History Check does not contain convictions imposed outside of Queensland – if you require a complete disclosure of your Criminal History across all states and territories of Australia, you need to apply for a National Criminal History Check. Queensland Criminal History Check is most sought after for the court related purposes while a National Criminal History Check is generally required for employment or volunteer purposes. Where can you obtain a National Criminal History Check? For employment or volunteer purposes, you can apply through InterCheck online portal. InterCheck Australia is a government accredited provider and therefore we have direct access to the government database. The normal turnaround time is from 1 to 2 business days ( 80% of the applications) and if your application is flagged for manual processing, you can expect it would take between 2- 10 business days. If you previously applied through InterCheck and need to track your application status, you can log into your account here with your email and password. 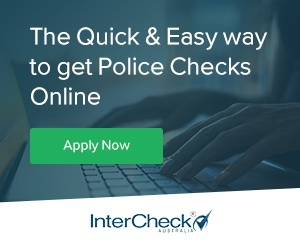 What is the difference between a National Criminal History Check obtained from Queensland Police and the one from Intercheck? There is no difference between the National Police Check Certificate issued by Intercheck or a Queensland police station. We use the same database as the Australian Federal/ State Police. The only difference is, that a National Police Certificate issued by Intercheck, will have our logo on it. No printing or scanning required. No need to sign documents. No waiting weeks and weeks for the results. 5 years for other cases, unless you were ordered to pay restitution, and then until you have paid. 10 years for all other cases. Note: Prosecutors, courts and certain jobs may still require you to mention your criminal history, even if the appropriate time has passed. The advice is to always read documents you have been given to very carefully, and if necessary, you can seek legal advice. In some cases, you don’t have to mention old minor convictions after a certain amount of time has passed due to the Spent Convictions Scheme. The scheme covers convictions for minor federal, state and foreign offences, with protection depending on the type of offence. It also covers pardons and quashed convictions. There are some limited exceptions excluded from the scheme. The Attorney-General has also granted exclusions from the scheme for several categories of employment. That means if you apply for such positions must declare all convictions, or any convictions for specific offences, as required for the specific position. If you want to learn more about the Spent Convictions Scheme, please contact the Queensland Police.